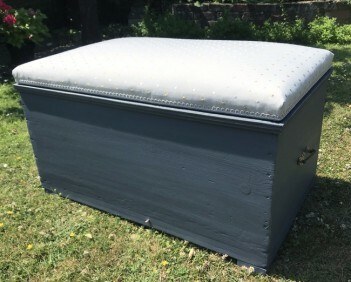 This is a solid pine Victorian Pine Ottoman. We have restored it, adding the feet and mending the beading. We've then fully prepped and handpainted it using Grand Illusions Paint in Nordic Blue, then varnished. The top has been professionally recovered in a lovely pale blue dotty fabric. We've added the handles on the side, both as decoration and for practical lifting purposes.